The Char Broil 475 4-Burner Cart-Style Gas Grill is a wonderful grill and the perfect appliance for the patio or outdoor area. Grilling is a favorite pastime for many during the summer months. It is a time to take it slow, cook dinner outside, and enjoy the beautiful days of the months when school is out and life relaxes some. When you’re ready for your backyard BBQ, you should consider the new Char Broil Performance 475 Cart-Style Gas Grill for your cooking. This sleek unit offers a stylish look to your backyard kitchen while providing ample cooking area and delicious food. It’s easy to clean up, easy to start, and always ready to cook your favorite steaks or burgers in a flash. If you enjoy convenience, the cart style gas grill is the all-time favorite style in a grill! With 36,000 BTU and 10,000 BTU lidded side burner there is plenty of heat for the perfect well-ness and tenderness. The primary cooking space of 475 square inches and four burners allow plenty of space and accurate cooking for larger cookouts like inviting the crowd over for ribs or franks and hamburgers. There is also a lid mounted temperature gauge, allowing perfect heat control (a feature my husband loves!) As for me, I love the metal side shelves that allow me some work and prep space while preparing my meal. The Char Broil Gas Grill offers porcelain coated cast iron grates for even cooking and easy cleanup. It offers 475-square inches of cooking space for you to place your favorite vegetables, kabobs, or hot dogs all on the grill at one time. It also offers a porcelain coated swing away rack that provides another 175-square inch of cooking space. You can easily cook for a larger crowd or a small one with the convenience of the gas grill. These coatings also help to keep the grill rust resistant to keep you cooking for years to come. This backyard addition is easy to use with a variety of features making cooking on your new grill seamless. To start up the grill you can utilize the easy electric ignition that starts with the touch of a button. This reduces the preparation time you need to get cooking. Unlike charcoal grills that take a long time to get heated up, this one can heat up in a flash and you’re ready to cook in minutes. Keep all of your plates and utensils at your fingertips with extra-large shelves that offer prep space or space to keep your sauces ready to use. Removable items such as the grease tray make it simple for you to clean up the grill after cooking and once it has cooled down. The grill also is on rolling wheels so you can move the item where you want it to safely and simply. As for the cleaning of the barbecue, things couldn’t be easier. A removable grease pan allows quick cleaning. The grill is easy to light with an electronic ignition, so there is no scare of flames igniting. So far Amazon offers over 568 reviews on this particular grill model. The Char Broil is known for great grill products and this one is in line with the rest. The overall rating from customers who have purchased and used this grill model is 4.1 out of 5 stars. 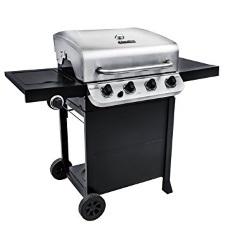 People who shared their critical reviews were concerned about items such as missing pieces when the grill was delivered to their home, longer time putting it together, and it not heating as well as other grills. They found that they couldn’t get the traditional sear marks with this model as you can with other models of similar design. For those who are looking for an efficient gas burning grill, the Char Broil Performance 475 4-Burner Cart Gas Grill is a great choice. It is stylish and sleek offering a great addition to your backyard BBQ area. Whether you want to cook for a few family and friends or you want to cook for just you and your sweetheart, the grill is ready to provide a delicious meal. With four burners and ample cooking space, you can cook veggies and meat at the same time go get dinner on the table together. If you’re looking for a great new addition to your backyard patio or deck, this Char Broil Performance Cart Gas Grill is the one. With a great price and perfect features, it is surely a grill you’re going to enjoy. Ample cooking space, prep shelves, easy to clean setup, and rust resistant racks make this a great way to spend your summer evenings cooking for your friends and family. Get your favorite grilling items ready to try out your new grill today!